* The plant is planned to be operations by the end of 2011. * The plant is planned to be operations by the end of 2011. * It is intended that the plant will provide additional water to Melbourne, Geelong, Western Port and South Gippsland. * It is intended that the plant will provide additional water to Melbourne, Geelong, Western Port and South Gippsland. - * The plant is estimated to use about 90 mega watts (MW) of power from the grid, which translates to 2160mWh per day. While a commitment was made to use renewable energy to power the plant in an attempt to make it greenhouse neutral, it is likely the plant will be partly powered by a new co-located gas fired power station or from power from the grid from coal-fired power stations, both of which will produce significant greenhouse gas emissions. + * The plant is estimated to use about 90 mega watts (MW) of power from the grid, which translates to 2160MWh per day. While a commitment was made to use renewable energy to power the plant in an attempt to make it greenhouse neutral, it is likely the plant will be partly powered by a new co-located gas fired power station or from power from the grid from coal-fired power stations, both of which will produce significant greenhouse gas emissions. * The plant is expected to emit 200 million tonnes of brine to the ocean. * The plant is expected to emit 200 million tonnes of brine to the ocean. * The plant will be constructed using a Public-Private Partnership (PPP) and could end up being foreign owned. * The plant will be constructed using a Public-Private Partnership (PPP) and could end up being foreign owned. - The proposed plant is estimated to need between 90 and 120 mW of electricity to operate. + The proposed plant is estimated to need between 90 and 120 MW of electricity to operate. - * Domestic water tanks are capable of supplying over 95 per cent of the water for houses in Melbourne. + * Domestic water tanks are capable of supplying over 95 per cent of the water for a house in Melbourne. * 600,000 households could save up to 160 gigalitres of water per year by using captured rainwater and reducing their daily consumption. * 600,000 households could save up to 160 gigalitres of water per year by using captured rainwater and reducing their daily consumption. - * The energy required for domestic water tank pumps would multiply to 140 kWh of energy per day for these same households. + * The energy required for domestic water tank pumps would multiply to 140 KWh of energy per day for these same households. * The proposed desalination plant would consume 15 times as much energy just to operate. More energy would be required to pump the water it produces to Melbourne. * The proposed desalination plant would consume 15 times as much energy just to operate. More energy would be required to pump the water it produces to Melbourne. + Unfortunately, the community will be forced to pay for the desalination plant, whether they want it or not, without any consultation or serious consideration of alternatives such as [[Water tanks|domestic water tanks]]. + The 15 year drought afflicting Victoria broke during the winter of 2010, with reservoirs reaching a storage level of over 45% after a period of consistent rainfall, which means that desalinated water will not be required for some time. A "water security payment" has been guaranteed by the government to the private consortium building and operating the plant. This payment will be made regardless of water produced by the plant and is designed to provide guaranteed financial returns to private investors in the project. The Victorian government has refused to disclose the amount of this payment, claiming that it is "commercial in confidence". + During periods of higher rainfalls, desalinated water will not be required, but these "water security payments" will still be made at the consumer's expense. + During times of reduced rainfall and storage levels, the plant could operate at full capacity and produce up to a third of Melbourne's water requirements. The desalinated water could be directed to storage reservoirs and fill them to levels where water restrictions would be reduced, which could in turn lead to increased water consumption. + This matter was raised in several submissions to the EES and does not appear to have been addressed in plant design - and will be very expensive to rectify. + The secrecy of the process regarding site selection and plant design has contributed to apparent major problems that could have been avoided if a more transparent and thorough process was used. + The Liberals (Ted Baillieu) have said that they would reveal design and financial information relating to the plant as it does not need to be commercial in confidence. The tender has been awarded, contracts signed, and there is no competitor. - * The capital cost of the plant would could equip about 600,000 households with tank systems and pumps (at $5000 per house) that could provide more water than the plant's estimated production. Combined with recycling sewerage water and protecting our catchments, we may not even need desalination. This option would require about 140 mWh of energy per day, while the desalination plant would consume 15 times as much energy just to operate (2160 mWh per day). + * The capital cost of the plant would could equip about 600,000 households with tank systems and pumps (at $5000 per house) that could provide more water than the plant's estimated production. Combined with recycling sewerage water and protecting our catchments, we may not even need desalination. This option would require about 140 MWh of energy per day, while the desalination plant would consume 15 times as much energy just to operate (2160 MWh per day). - * [[Stop logging Melbourne water catchments|Stopping logging in Melbourne's water catchments]] would provide and extra 30 gigalitres of water, which would be much cheaper than paying for the same amount of water to be provided by desalination. This water would also not require pumping to Melbourne. + * [[Stop logging Melbourne water catchments|Stopping logging in Melbourne's water catchments]] would provide an extra 30 gigalitres of water, which would be much cheaper than paying for the same amount of water to be provided by desalination. This water would also not require pumping to Melbourne. - * [http://www.yourwateryoursay.org/ Your Water Your Say] -- Action group of families and individuals concerned that the future water provision in Victoria is achieved through environmentally sustanible means. We have all been working relentlessly to establish the groundwork for our anti-desalination campaign. + * [http://www.watershedvictoria.org.au/ Watershed Victoria] - Watershed Victoria is an incorporated group that envisions justice and sustainability in water policy and projects across Victoria (and beyond). They lobby, collaborate, research and educate on water policy and options. :"We are staring down the barrel of running out of water," says Priestley. Rainwater tanks, groundwater, stormwater, desalination, recycling, new dams, more efficiencies all need to be on the table - "each city has to look at all options, not put a red line through any of them, including recycling." :"We are staring down the barrel of running out of water," says Priestley. Rainwater tanks, groundwater, stormwater, desalination, recycling, new dams, more efficiencies all need to be on the table - "each city has to look at all options, not put a red line through any of them, including recycling." Plans to build a desalination plant at Wonthaggi in Victoria, Australia, were announced by the Bracks Labor government in June 2007. Household water bills are expected to double over the next five years to pay for a $4.9 billion water strategy to secure Melbourne's water supplies. Estimated water production is 150 billion litres (150 gigalitres) of fresh water per year, approximately a third of metropolitan Melbourne's needs based on 2007 consumption levels. The plant is planned to be operations by the end of 2011. It is intended that the plant will provide additional water to Melbourne, Geelong, Western Port and South Gippsland. The plant is estimated to use about 90 mega watts (MW) of power from the grid, which translates to 2160MWh per day. While a commitment was made to use renewable energy to power the plant in an attempt to make it greenhouse neutral, it is likely the plant will be partly powered by a new co-located gas fired power station or from power from the grid from coal-fired power stations, both of which will produce significant greenhouse gas emissions. The plant is expected to emit 200 million tonnes of brine to the ocean. The plant will be constructed using a Public-Private Partnership (PPP) and could end up being foreign owned. The Bracks government opposed the construction of a desalination plant during the 2006 Victorian State election, but reversed its position after the election and committed to building it. There was no proper public consultation process that provided input to inform the Government decision to build the plant. Significant energy (with associated greenhouse gas emissions) will be required to pump desalinated water from Wonthaggi to Melbourne. More than 1.4 million tonnes of greenhouse gas will be pumped out during the construction of Victoria's proposed desalination plant, and another 1.2 million tonnes emitted each year once it starts boosting Melbourne's water supply. Greenhouse emissions during the construction of the plant, and about 70,000 tonnes from waste decomposition and transport during its operation, will not be offset. Using a two-headed marine structure extending up to two kilometres offshore, the plant will take in 480 billion litres of seawater and pump back 280 billion litres of saline concentration each year. Floodwater has again threatened the South Gippsland site of proposed desalination plant. 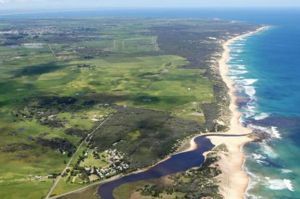 Flooding of the site in 2007 was called a "one-in-100-year" event by the State Government, but water from the Powlett River has flowed again over land set aside near Wonthaggi. The proposed plant is estimated to need between 90 and 120 MW of electricity to operate. Domestic water tanks are capable of supplying over 95 per cent of the water for a house in Melbourne. 600,000 households could save up to 160 gigalitres of water per year by using captured rainwater and reducing their daily consumption. The energy required for domestic water tank pumps would multiply to 140 KWh of energy per day for these same households. The proposed desalination plant would consume 15 times as much energy just to operate. More energy would be required to pump the water it produces to Melbourne. It has been reported that water bills for Melbourne households will almost double over the next five years. Water price plans released by the Essential Services Commission show metropolitan water providers will charge between 87 per cent and 96 per cent more for water. Water Minister Tim Holding, has stated that Melbourne residents need to help pay for major water infrastructure projects, such as the desalination plant and the Sugarloaf (North South) pipeline. Unfortunately, the community will be forced to pay for the desalination plant, whether they want it or not, without any consultation or serious consideration of alternatives such as domestic water tanks. A Department of Sustainability and Environment report tabled in the Victorian parliament in September 2010 stated that in cash or nominal terms taxpayers will pay at least $15.8 billion to the Aquasure Consortium to operate and maintain the plant for 28 years after it begins operation at the end of 2011. Water Minister Tim Holding confirmed that the construction and operation of the plant would be $5.72 billion stating that "The reports in today's Age do not accurately describe the water security payment". The 15 year drought afflicting Victoria broke during the winter of 2010, with reservoirs reaching a storage level of over 45% after a period of consistent rainfall, which means that desalinated water will not be required for some time. A "water security payment" has been guaranteed by the government to the private consortium building and operating the plant. This payment will be made regardless of water produced by the plant and is designed to provide guaranteed financial returns to private investors in the project. The Victorian government has refused to disclose the amount of this payment, claiming that it is "commercial in confidence". During periods of higher rainfalls, desalinated water will not be required, but these "water security payments" will still be made at the consumer's expense. During times of reduced rainfall and storage levels, the plant could operate at full capacity and produce up to a third of Melbourne's water requirements. The desalinated water could be directed to storage reservoirs and fill them to levels where water restrictions would be reduced, which could in turn lead to increased water consumption. The Victorian auditor-general found that the proposed desalination plant will cost $2 billion more than State Government estimates. The auditor-general's report, tabled in Parliament on 6 October 2010, showed the desalination plant will cost more than $18 billion over the next 30 years - $2 billion more than the Government estimated last month. The desalination plant has been designed so that prevailing ocean current brings "fresh" sea water to the intake and takes salinated output away. However, for some months of the year this ocean flow in Bass Straight is reversed, so the salinated output is likely to contaminate the intake - "short circuiting" the process. This will impact efficiency of plant This matter was raised in several submissions to the EES and does not appear to have been addressed in plant design - and will be very expensive to rectify. The secrecy of the process regarding site selection and plant design has contributed to apparent major problems that could have been avoided if a more transparent and thorough process was used. The Liberals (Ted Baillieu) have said that they would reveal design and financial information relating to the plant as it does not need to be commercial in confidence. The tender has been awarded, contracts signed, and there is no competitor. The capital cost of the plant would could equip about 600,000 households with tank systems and pumps (at $5000 per house) that could provide more water than the plant's estimated production. Combined with recycling sewerage water and protecting our catchments, we may not even need desalination. This option would require about 140 MWh of energy per day, while the desalination plant would consume 15 times as much energy just to operate (2160 MWh per day). Stopping logging in Melbourne's water catchments would provide an extra 30 gigalitres of water, which would be much cheaper than paying for the same amount of water to be provided by desalination. This water would also not require pumping to Melbourne. "Rainwater tanks are five times more energy efficient than desalination plants and twice as energy efficient as the proposed Traveston dam, per megalitre of water produced. "If governments deployed rainwater tanks to 5 per cent of households each year in Sydney and South-East Queensland, dams and desalination plants planned for 2010 could be delayed past 2026 (Sydney) and 2019 (SEQ). "Most Australian houses are suitable for a rainwater tank. In Sydney 65 per cent (or 1.1 million houses), in SEQ 73 per cent (or 900 000 houses) and in Melbourne 72 per cent of existing houses have potential for a rainwater tank. "While 38 per cent of households in Adelaide have rainwater tanks, fewer than 6 per cent of the houses in Melbourne, Sydney, South-East Queensland and Perth do,” said ACF’s urban water campaigner Kate Noble. "Rainwater tanks collect and store water far more efficiently than dams, especially in times of drought. As the climate changes we should be installing tanks to take advantage of the rain that does fall on our rooftops. "If governments systematically installed rainwater tanks in Australia’s major cities, we would secure as much water as the planned Kurnell desalination plant in Sydney, the Tugan desalination plant on the Gold Coast and the stage one of the unpopular Traveston Dam proposed for Queensland’s Mary River,” Ms Noble said. Watershed Victoria - Watershed Victoria is an incorporated group that envisions justice and sustainability in water policy and projects across Victoria (and beyond). They lobby, collaborate, research and educate on water policy and options. "We are staring down the barrel of running out of water," says Priestley. Rainwater tanks, groundwater, stormwater, desalination, recycling, new dams, more efficiencies all need to be on the table - "each city has to look at all options, not put a red line through any of them, including recycling." This page was last modified 07:07, 10 November 2010. This page has been accessed 201,946 times.